In a perfect world, the procurement process facilitates the purchase of services, supplies, and construction in support of essential public functions in a way that is transparent, efficient, accountable, and fair. Instead, it’s an outdated, time-consuming, and painful experience for both those seeking to buy and those trying to sell. Creating a smooth process can be a big challenge, particularly in today’s market. With private work booming, it is growing increasingly difficult to attract top-notch vendors and integrators for public projects. This makes taking a strategic approach to procurement more important than ever. • The client is clear about what they are seeking in a product or solution. • The vendor can present value in the right product(s), skill set(s), differentiators, and methodology for implementation. 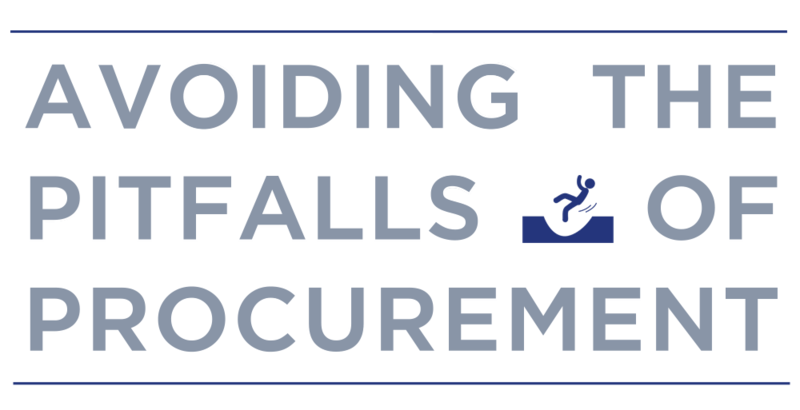 Any procurement document that makes it difficult to communicate effectively with interested parties reduces the likelihood of receiving qualified bids. First, determine whether your needs are more suited to a request for proposal (RFP) or a request for quote (RFQ). Make sure you select the appropriate type of procurement vehicle for the need at hand. RFPs allow vendors to be creative in their responses as you are asking for a proposal, rather than a hard quote based on an exact set of components and design criteria (as in an RFQ). RFP respondents are offered the opportunity to provide input for value-added services. That said, it is important to carefully craft the RFP in a way that will allow you to accurately compare the responses. No matter the type of effort you pursue, do work with your procurement office closely to ensure the technical requirements of the project are appropriately blended into the required procurement language for your organization. This can become tricky and will likely require additional coordination between multiple departments in more complex projects, for example a multi-campus security solution should include experts from procurement, facilities, and technology departments. There are two particularly well documented challenges to getting good responses from qualified vendors on public projects. The ‘race to the bottom’ and ‘rubber-stamp’ mentality. Many vendors have started to decline to participate in public efforts based on these common perceptions. Procurement laws tightly regulate public projects in an effort to maintain fiduciary responsibility to constituents. All too often, this process sets the stage for a ‘race to the bottom’ as vendors think they need to have the lowest price to win the job. That approach, especially if combined with a poorly written or incomplete RFP, can result in a qualified vendor without the information necessary to provide a complete cost, at best. Worse, this can result in a shoddy or incomplete work product by a less-qualified vendor. Most often, we see this approach result in change orders that extend the project schedule and balloons cost beyond the budget. Rather than a win-win, this short-sighted view can result in a lose-lose situation. Instead, consider scoring proposals before pricing is opened, or weighting the scores so that price can tip the scale but not dominate it. Another particularly pervasive notion is that a winner has already been identified before the procurement process even begins. If vendors believe the requesting entity is only seeking a ‘rubber stamp’ for a decision that has already been made, it will be difficult to get top candidates to respond. The key is getting the right players to the table in a way that satisfies not only the letter, but the intent, of the law. A well-written RFP is the best way to get the right players at the table. Reframe the procurement request to benefit everyone involved by making it clear that you are looking for the lowest responsive bid — the one that provides the best value and overall solution — rather than just the bottom-dollar bid. This RFP should detail your requirements, specify accountability metrics, and include provision for options and component pricing in simple terms. Use the specifics of your environment to positively influence the process; make your “ask” clear so that the responses are equally clear. This will help prevent bids that are falsely inflated (to cover the “what ifs”) or unreasonably low (which increases the likelihood of expensive change orders). Offer a common platform for all responses, but allow vendors to show their differentiators and unique approach, including any value-added elements. Consider adding a scoring component that addresses overall responsiveness; giving credit to vendors who show initiative in understanding your environment and suggesting an innovative solution. Public procurement — specifically in producing RFP documents that elicit responses and engagement from the right players — requires skill, expertise and focus. If you do not have this level of experience in-house, consider seeking outside help to create your RFP. NIS does not play the “rubber stamp” game. Instead, we establish clear requirements and encourage participation from a number of qualified players. Our focus is on ensuring clients have a successful procurement experience. Interested in learning more or have questions about our procurement process? We are here to help. Contact NIS today.